What a talented mutt! 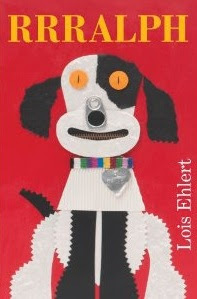 In Lois Ehlert's just-out collage extravaganza, RRRalph (Beach Lane, 2011), Ralph has an answer for every question. Storytime audiences and young readers will quickly catch on to the device and begin to predict Ralph's answers to the next questions--what's on tree trunks? "Bark! Bark!,/span>"; that scary critter outside the fence has to be a... "Wolf" at the gate; and Ralph readily answers "Yep! Yep!" to an invitation to enjoy the sanctuary inside the house. Ralph is a trademark Ehlert collage creation, with button eyes, a soda-can pop-top nose, and a zipper for teeth. Ehlert augments her "found object" collage illustrations with textured paints set against brilliantly bright pages, and with her giggle-getting and brain-teasing wordplay riddles, this latest is sure to earn a BOW and WOW from the picture book crowd. Ehlert is the undisputed master of this genre. Some of her other masterpieces of collage art books are Waiting for Wings, Leaf Man (Ala Notable Children's Books. Younger Readers (Awards)), Planting a Rainbow, Color Zoo, and the mega-cool Snowballs.